The golfing of Vietnam tourism creates many chances for world-wide golfers to play in some of the World's best golf courses: King golf island(36 holes), Chi Linh star golf course(36 holes), Phoenix golf course(54 holes), Montgomerie Links.... Join the golf tours of Vietnam to highlight your lifetime golfing. 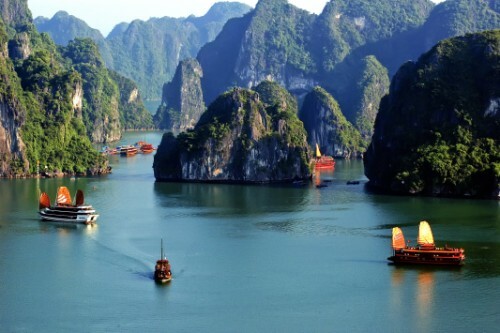 Limited offers for the best of Vietnam tours. Tour name: Heaven for world-wide golfers. Enjoy a wonderful golfing round at Chi Linh Star Golf and Country Club. With 27 holes of challenging international standard golfing, the golf club is one of Vietnam's newest opening in late 2003, and is located about half way between Hanoi and stunning Halong Bay. Chi Linh Star Golf & Country Club was chosen for the first professional golf tournament in the north Vietnam, the 2004 Carlsberg Masters Vietnam. Drive to Halong Bay for overnight. Enjoy an other morning round of golfing at the Montgomerie Golf Links. Then, take a short flight to Ho Chi Minh city in the afternoon. Overnight in Saigon City. Take a morning flight to Dalat city with the altitude of five thousand feet above sea level, Dalat enjoys a cool climate that doesn't burn the sensitive bent or wear out golfers. Overnight at hotel in Dalat. (Meals: B,L). Free at leisure until transfer to the airport to catch departure flight. End of service. Book the best Vietnam golf tours, just one time to remember unique experience for your lifetime golfing. If not fully satisfied with the tour, you will have money back. Limited offers for the best golf tour of Vietnam.